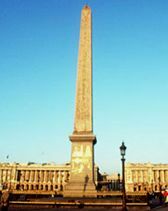 It may be the Place de la Concorde, but this square in Paris has a bloody history with more than 1300 people beheaded by the Guillotine within its boundaries. They included Louis XVI, Marie Antoinette, Charlotte Corday, Danton and, eventually, the architect of The Terror Robespierre himself. Originally Place Louis XV, it was changed by revolutionaries to Place de la Revolution. Later governments thought it wise to rename the area in the hope of lessening its darker history. A central 230-tonne, pink-granite obelisk from Luxor dominates the site rising 23 metres into the air and its accompanying eight female statues stand at the corners of the square.